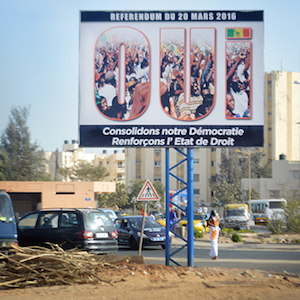 On 20 March, Senegalese citizens went to the polls to vote on a constitutional referendum initiated by President Macky Sall. Participants had to vote either ‘yes’ or ‘no’ on the 15-point proposed reform plan, which includes reducing the presidential term from seven years to five. A majority of 62.7% voted in favour of the changes, according to the preliminary results released on 23 March. The referendum has been the source of much political tension this year, and especially in recent weeks. Organised within a month, there was a lack of consultation with political actors and civil society prior to the referendum. There was also no sufficient awareness campaign to ensure that the population fully understood the scope of the proposed reforms. The respective ‘yes’ and ‘no’ camps were allowed only one week of referendum campaigning between 12 and 18 March. Given this context, it is little wonder that the participation rate has been so low with a turnout of only 38.26%; the lowest of all referendums in the country’s political history. The referendums that took place in 1963 and 1970 saw a participation rate of more than 94%, while the 2001 saw a turnout of 66%. Several others factors may further explain the high abstention rate. The first is related to the perception of many Senegalese citizens that President Sall has not kept his word. In between the two rounds of the 2012 presidential elections, Sall had vowed to reduce the presidential term from seven to five years if elected; a reduction he’d promised would apply from his first term. In Wolof, the most widely spoken national language of Senegal, the failure to keep one’s word is called ‘wax waxétt’. The term evokes another important political event that dates back to 2011 when, contrary to his promises, former President Abdoulaye Wade had contended for a third term. He was defeated by Macky Sall. In mid-January, in preparation for the March referendum, Sall submitted the draft reforms to the Constitutional Council review. On 12 February, the council declared that the part of the reform focusing specifically on the ongoing term reflects neither the constitutional spirit, nor the constitutional practise. Sall then announced that he would abide by the opinion of the Constitutional Council and stay in power until the end of his current term in 2019. This alienated a large number of citizens, who no longer saw the value of the referendum. The legal-political debate that ensued further complicated people’s understanding of the proposed reforms. The referendum has also been tainted with political overtones, in light of the upcoming elections. This has been another factor behind the low voter turnout. Instead of seizing the referendum as an opportunity to promote political awareness, the referendum campaign seemed to turn into more of an electoral campaign for Sall and other political leaders. The proposed reforms also saw a clear division among the country’s political forces as they positioned themselves and took stances according to their current interests. After the initial results were announced, former prime minister, Aminata Touré, applauding the majority ‘yes’ vote in the commune of Grand Yoff, said: ‘I took my revenge on Khalifa Sall.’ Touré was referring to the mayor of the city of Dakar, who defeated her in this commune during the 2014 local elections. Touré, a member of the ruling party, the Alliance of the Republic, was subsequently dismissed from her position of prime minister. In this context, the debate focused more on reducing President Sall’s current mandate than on the proposed reforms and their future relevance. For many political leaders, the outcome of the referendum served as a popularity barometer, especially in view of next year’s legislative elections. The proposed reforms covered more than just presidential term limits, however. Some of the 15 points proposed were derived from the draft constitution prepared by the National Commission for institutional reforms (NCIR). Established in 2013, the commission was responsible for conducting national consultations and to propose reforms to improve the functioning of institutions, as well as to consolidate the rule of law and democracy. Some of these reforms were well received. These include reforms to strengthen the rights of the opposition and its leadership; as well as the participation of independent candidates in all types of elections. The powers of the National Assembly have also been broadened in their scope to control government action and evaluate public policies. Members of Parliament can, for example, now direct questions to ministers at any time, and they are obliged to respond. Other reforms include new rights on natural resources and land heritage. Some reforms, however, also raise concerns. These include the creation of a new High Council of Territorial Communities, which is reminiscent in some ways of the Senate and the Council of the Republic for Economic and Social Affairs. These institutions were seen to serve certain political interests. This perception is compounded by a lack of clarity over how members would be appointed; especially in light of the 2017 legislative elections. Furthermore, some reforms proposed by the NCIR were not included in Sall’s reform plan. These relate, among others, to the independence of justice and ways to improve the fight against corruption. At the end of the day, the debate on the reduction of Sall’s current mandate, combined with electoral overtones, overshadowed the other 14 proposed reforms. While the referendum was supposed to create the foundations for a sustainable consensus on the Constitution and consolidate Senegal's democracy, the referendum has instead divided both political forces and civil society.